You have been blessed with a daughter, a sister and an Angel. I am sorry you are not able to hold her the way you had dreamed. I am amazed with the grace you have honored her while your hearts are trying to not to break. I love your strength and resolve to handle your grief in your own way. I have read all your posts and believe that speaking of your sweet Sarah will keep her presence in your family. Right where she belongs. My family thinks I am strange because, I believe we are born from Heaven some how our family on earth is chosen by us as little angels. God guides our choices throughout our journey of life. 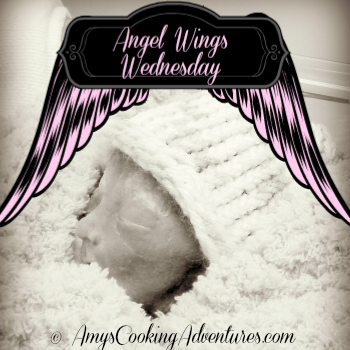 Sarah's Sweet Angel Wings were earned far to soon. There are no guide books on the proper way to grieve. You and your family will do what is right for all of you. I send my prayers that your hearts never forget Sarah but, you all find peace with the loss of your little girl and sister. How about a simple, my two boys here and my daughter in heaven and leave it go like that. Of course, you will get sympathy but hopefully not pity. Heaven is a pretty cool place to be. I am sorry that you have to go through this Amy. People don't mean to be thoughtless, but not having walked in your shoes we don't know how to express our love and concern.